When putting together graphs for presentations, press releases and general analysis, I’m often reminded by my colleagues to keep it clear and simple. With that in mind, here is the first in Cambashi’s new “Chart of the Month” series with 583 data points. First, let me explain what the graph is showing. 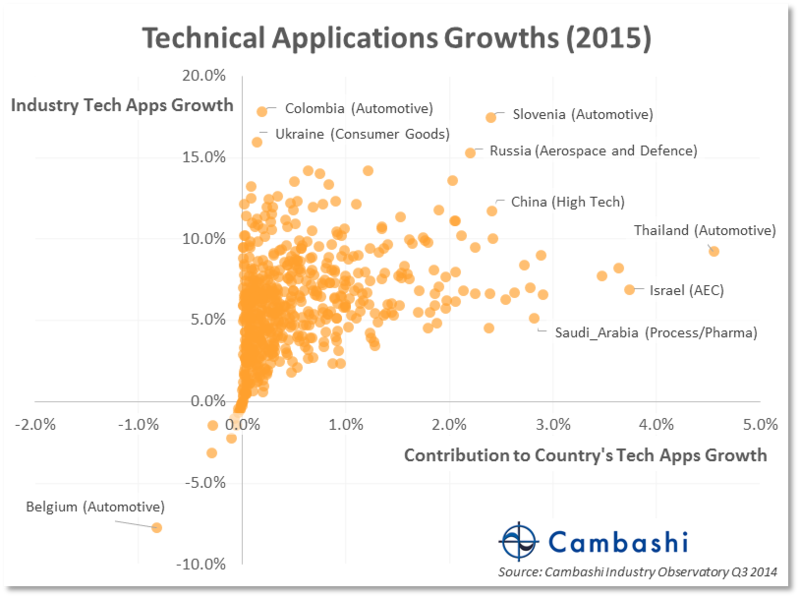 Taking technical application spend data from Cambashi’s Industry Observatory, each data point represents an industry group in one of 53 countries. Technical applications includes products such as BIM, CAx, PLM, GIS and related applications. The y-axis shows the technical applications growth of each industry in each country – technical applications are growing at 17% in the automotive industry in Slovenia. The x-axis shows the contribution of the industry to the country’s overall technical applications growth – automotive is contributing 2.4% to Slovenia’s overall technical applications growth of 3.6% in 2015. So, why this graph? When looking at tables or charts of growths it’s easy to be attracted to large, double digit growth numbers like Colombia automotive in the example above. How can 18% growth not be an attractive investment opportunity? This graph is one way of exploring questions like this. Back to my question, how can 18% not be an attractive investment opportunity? Well, the graph tells us that the automotive sector, despite its large growth, is contributing very little to Colombia’s overall growth. Why is this? It could be because Colombia simply isn’t growing very much generally, but I can tell you that’s not the case. We expect Colombia’s technical applications market to grow by 7% in 2015. Perhaps then the automotive industry just isn’t significant in the context of Colombia overall? Our data can answer this too, and yes, we expect the machinery industry to spend 4x more on technical applications in 2015 than the automotive industry, and the AEC industry will spend an enormous 34x more! Clearly other industries, like these two, are much more important in the context of Colombia’s overall technical applications market; despite growing at a lower rate than automotive. Where are the best opportunities then? If you’re looking at investment opportunities the upper right hand side of my graph would be an excellent place to start. Of course, a simple graph like this can’t tell you everything. You will need to consider other factors like conditions for foreign investment or government subsidies. What the Industry Observatory does give you is an authoritative and data-driven lens to help focus your market intelligence decisions. Want to find out more? Please contact Dan Roberts at Dan.Roberts@cambashi.com or Tel: +44(0)1223 460439.